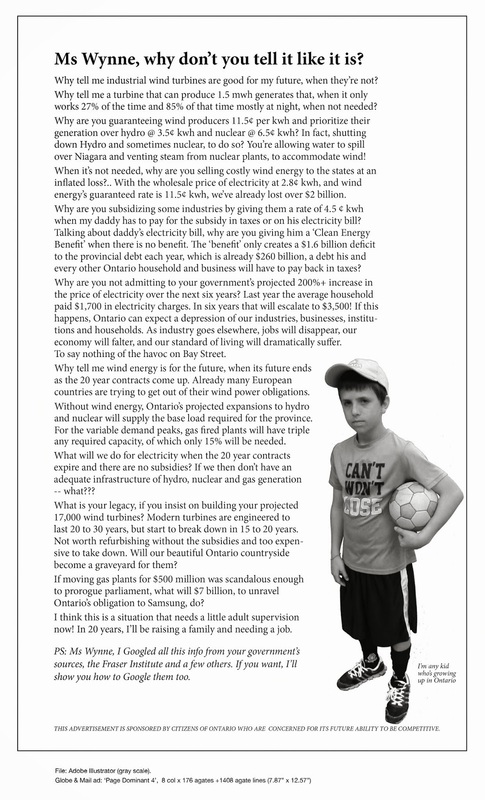 Rural Ontario “in Crisis” | Mothers Against Wind Turbines Inc. Soaring hydro costs have created a crisis situation in Ontario that is especially concerning in rural areas like Grey-Bruce, says the head of one of the local agencies that is helping people to keep their lights on. Francesca Dobbyn, executive director of the United Way of Bruce Grey, which has released a report on utility assistance provided to households in the region over the past year, pointed to national news reports that quote the Ontario Energy Board as saying nearly 60,000 residential customers were disconnected in 2015 from hydro services due to non-payment. That number was confirmed by The Sun Times Friday. “If we had 30 kids in Ontario with the measles, we’d have a health crisis. With 60,000 households in Ontario who were disconnected from hydro, that’s a crisis. And in rural Ontario, when that disconnection means you can’t use your well, that’s a public health crisis,” she said in an interview. The local United Way’s report found that from July 1, 2015, to June 30, 2016, the United Way, along with Bruce and Grey counties, Y Housing and the Salvation Army in Wiarton distributed nearly $750,000 to help people with hydro or natural gas arrears or to purchase wood, oil or propane to heat their homes. That figure rises to more than $1 million, the report says, when factoring in the staff time and resources provided by the agencies. Dobbyn said while that number alone is startling and points to a “crisis brewing in our region,” it doesn’t include the financial assistance provided to people by other sources, such as churches or other organizations or by family members or friends. The report says electricity costs have climbed by 100 per cent in the past decade. Rural residents have been hardest hit, Dobbyn said, because they are charged higher delivery costs by utility companies. Rural residents, on average, pay almost double the delivery rates compared to households in “urban high density” areas, according to the United Way report. An average household in a low-density area is charged about $84.46 for delivery, distribution, connection, network and other fees, the report says, while homes in high-density areas pay about $44.50. And that’s without using any energy at all, it says. Homes that use baseboards for heat pay about $80 a month in hydro rates on top of the delivery fees. “And that’s before turning on a light or using a microwave or any other source of electricity,” Dobbyn said. The numbers, she said, show that even while conserving energy in the home, people in rural areas are still facing high monthly hydro bills. “Our clients, our families are not wasteful. They do everything they can to reduce consumption, they unplug everything and we often advise them to turn breakers off in an effort to reduce their bill,” she said……….